Father, during this Easter time you have touched our lives with the healing power of your love. You have given us the freedom to be part of your Kingdom. 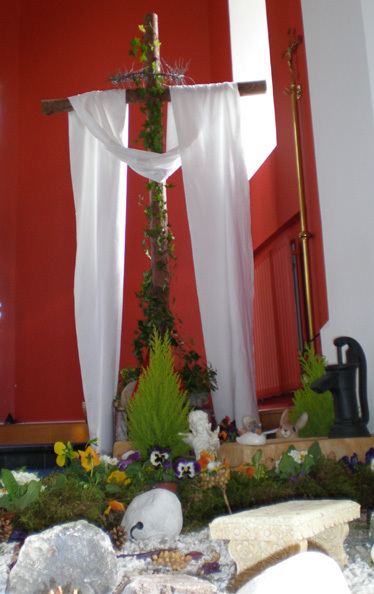 Our Easter Garden helps us to reflect on the Resurrection of Jesus. We recall the woman who went to the tomb to hear the words of the angel, ?why do you look for the living among the dead, He is not here, He has risen.? The flowing water gives us the images of life, the life that Jesus offers us if we turn to him. The presence of flowers, animals, nature and abundant colour reminds us that over this Easter period Jesus wishes to give each of us life and life to the full.